She also shown to be a great play companion to Anouk. She also share the interest of swimming with Brizna and Rex. In the summer she started her heat and next time she will be mated. In January/February of 2011. We are looking closer to 3 males and one of them we have had in out thoughts since Raika was born. More information closer to the mating day. 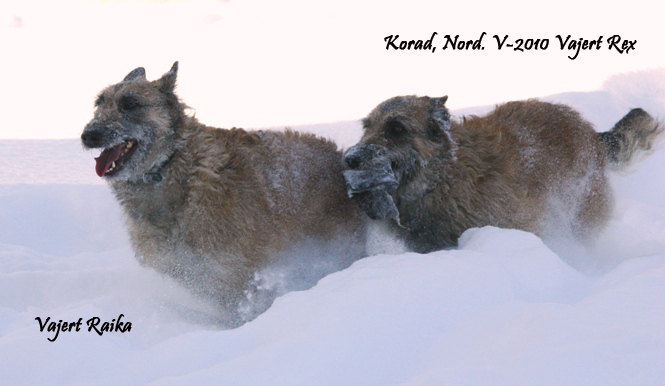 Raika has moved to kennel Acktiva in Finland (Owner of Vajert Ihana to the day Ihana left the earth) Good luck with Raika and we do miss her already. Swedish Mentally-test with no fear of gunfire.